A dimly lit room, a bed, the soft sound of rain outside... it might be all a bit more romantic if you weren't in Milcho Milchev and Martin Dimitrov's interactive fiction horror adventure Unholy Flesh. You wake up alone, head throbbing, in unfamiliar surroundings decorated like Pyramid Head had a stint on Trading Spaces. Who are you, and what's going on? To find out, you'll need to explore, solve puzzles, and track down the diary pages you'll discover scattered around to fill in the blanks. The handy in-game tutorial will walk you through the basics, but if you've played a text adventure, you know the drill. Type in commands like "look around" or "take ___" and hit [enter] to execute them, paying attention to the coloured text that will draw your eye to points or items of interest. The game makes use of a checkpoint system rather than saves, so since you can die repeatedly, it's best to pay attention to your surroundings. Be aware that while the game will restore you to your last checkpoint if you die, it will not do so if you exit the game and return to it later, forcing you to start from the beginning. The best way to describe Unholy Flesh's interface is tidy. 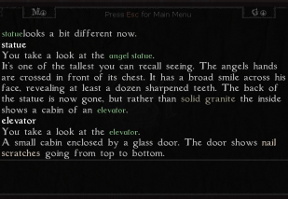 By using various colours of font to denote important objects you'll rarely miss anything, and the tutorial does a great job of hand-holding any potential newcomers to the genre while refreshing us oldsters... especially since looking under things in text adventures is uncommon enough that I appreciated it being pointed out. The story itself makes use of a lot of familiar tropes, but the use of sound effects and visual touches brings it to life with admirable subtlety that makes up for the cheesier moments. Waiting for the text scroll to finish before you can input your commands does get old, especially if you're replaying after a death, and while I can understand using checkpoints to recover from fatalities, not allowing players to manually save and load feels like a mistake. A few tweaks and optimizations would have gone a long way towards really making the game shine, including mute options and a proofread over the text since occasional burps like "leeding" instead of "leading" detract from an otherwise atmospheric story. Taken as a whole, however, Unholy Flesh makes for a fine creepy adventure that cultivates an air of mystery throughout. It's not particularly long, and as long as you explore everything and remember to use your inventory and your Resident Evil-esque problem solving skills the puzzles shouldn't give you much difficulty. It's on the short side, and the ending feels a little underdeveloped, but it's an effort packed with promise from two people with a clear passion for the genre that we'd love to see even more from in the future. Unholy Flesh Walkthrough now available! At this point, you have two options. You can DRINK ANTIDOTE, then GO THROUGH GATE, or just GO THROUGH GATE without drinking the antidote. Each will give you a slightly different ending. Attempt to travel down the stairs to the great hall, without lighting the torch. Reading the Bible on the Altar of the Great Hall. It goes up to page 11. After scaring the spider under the bed, it will make it's way to the bell tower. Try picking it up there. Go down the corridor in the underground office, without putting the lever in place. Make a bad mixture of chemicals and drink it. Creepy atmosphere, but storyline makes zero sense. The spelling errors are rampant. I wish developers would team up with great writers so these projects could really soar. I thought the story made sense. You, the protagonist, are best friends with the owner of the chapel. He feels guilty and somehow responsible for you being crippled during the war, and wants to do something to make you better. He begins a series of mad scientist experiments to try to create some sort of super soldier formula to fix you, but along the way he begins to go more than a little crazy. He starts experimenting on other people, using them in his testing, all because he's trying to help you. At one point, he locks you away when you object to his experiments because he thinks he's doing the best thing for you. He administers the drug to you, which heals you, but when you find out what happened and the price of it, the two of you fight, both enhanced by the serum, and you ultimately kill him but destroy the way out of the chapel. Your last decision is to wipe your own memory as the super strength of the serum wears off and hope that you never find out what happened... but of course you do because when you awake as the game starts, you are forced to follow the trail of breadcrumbs to the truth because it's the only way you'll manage to escape. That's why when you leave, the game says you carry with you a ton of guilt. Hey everyone, thanks for the review and feedback. We've just released a new version which aimed to fix most of the spelling errors. Also a hint for the text speed is added in the tutorial. Even using the walkthrough and exploring on my own, I can't find page 4 of the diary. Otherwise, great game and story. Honestly, I found John's attempts to protect and help his brother both touching and terrifying. I really wished that more of the usual IF shortcuts were implemented: I see that "examine" may be substituted by "x", but the shortcuts "i" and "l" for "inventory" and "look at/around" would have been greatly appreciated! I've had another game do this for me too... Despite having (and double-checking that I have) the latest version of Flash Player, the game tells me to install the latest version. Is this a time-sensitive thing where the game checks only for the version that was available at the time it was released, or does it still play okay for other people? It's the same for me. Shame. I really wanted to play this.